Walking through Denver’s Writer Square some time back I was stopped dead by an iconic (I thought) sculpture of a male figure’s self-emergence from a block of bronze. The block of bronze was cast to resemble a block of stone; the figure is wielding a hammer and chisel. The obvious conclusion, derived from the title, is that the man is in the process of self-creation. Maybe another way to look at this sculpture is that it is a metaphor for man freeing himself from something. In a very Zen way, maybe it’s a metaphor for a man liberating himself from the physical entrapment of the earthbound body – the spirit/soul trying to leave the body, although the body is doing the leaving. I said metaphor, that leaves a bunch of room for creative license. Another name (my term) for the piece of sculpture might be “I Shall Soon Be Free.” Maybe it’s (profoundly) simply a metaphor for life’s difficult journey. Well so far I’ve been stumbling around trying to explain a great piece of sculpture with words. I have failed miserably, but the artist has succeded in saying it without words, oh yea, there’s the title. No title is necessary for this monumental bronze. I was thinking that “I know that I know that piece but I just can’t seem to place it.” I erroneously thought that the sculpture was a classic bronze sculpture, probably Greek or Italian, maybe even a piece by someone like Michelangelo. I went into the nearby Knox Gallery to inquire. Whoa, I was told that it’s a contemporary work. “She began the first rendition [a 37″ bronze] of the work in Colorado in 1987.” So, it’s not really an iconic sculpture, but maybe something that looks like a famous icon will be someday, or should be. 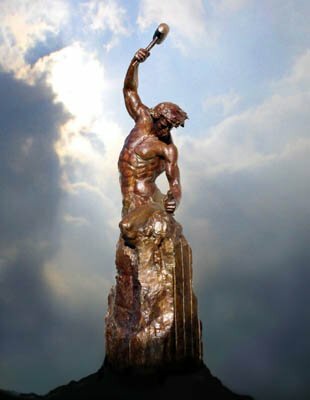 Without a doubt Self Made Man is my favorite piece of sculpture, in Denver, at the present time. It is so very cool. Is this the very essence of sculpture? Artwork – from posters ($55.00) to 14-foot, $135,000 bronze sculptures – can be purchased from the artist’s website or from Knox Gallery. Smaller bronzes are also available. The Moon will be 100% full June 26, 2010 at 4:31 A.M. Las Vegas time. *Adobe Moon In The City Poster available for purchase.